The climate is rapidly changing in the Arctic, and further changes are expected. 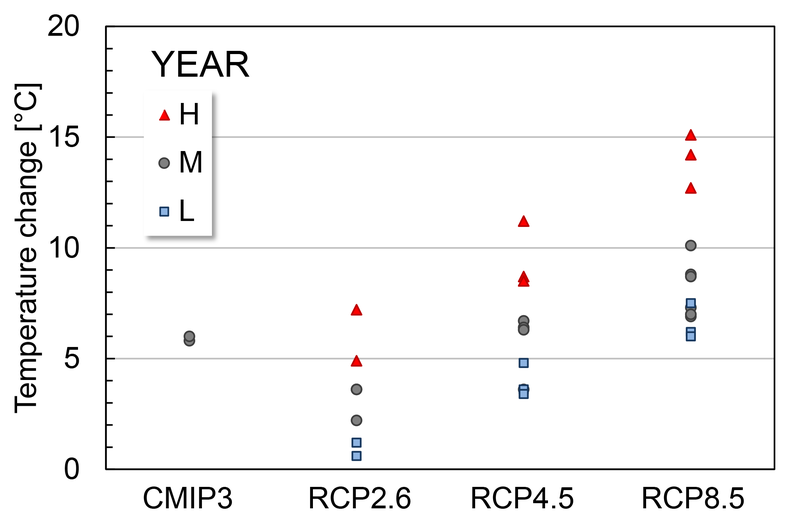 Weather variability in time and space is marked, and climate projections have large uncertainties. Detailed information on spatial and temporal variability of weather and snow is required to assess quantitatively climate change effects on tundra ecosystems. It is often said that “Weather is what you get; Climate is what you expect.” This reflects the fact that weather changes over short periods of time or distances, but climate represents the average of the weather over long time and some spatial extent. For example, the World Meteorological Organization recommends minimum 30 years for describing climate. Weather variability in time and space are particularly marked in Varanger and Svalbard, due to the topography and the climatic gradients between coastal and inland areas. 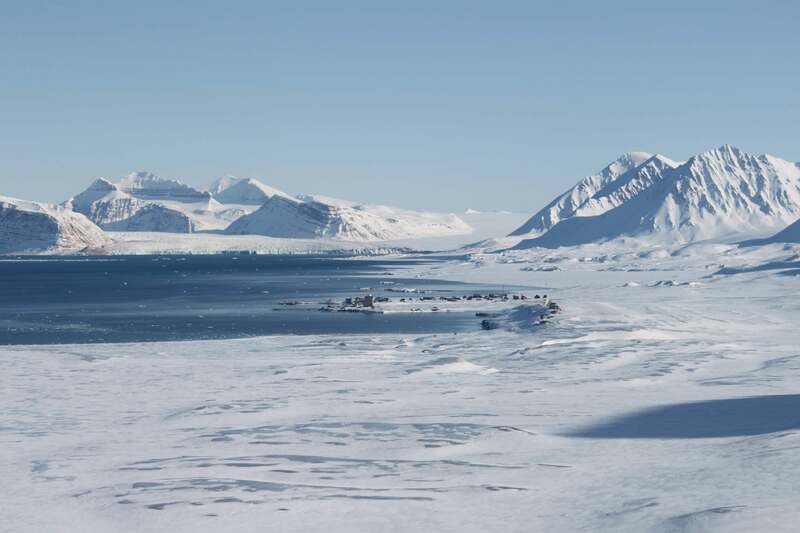 In Arctic environments snow and ice are critical elements of the weather and climate variability. They have many direct and indirect effects on different components of the ecosystems. The two COAT regions represent different climate contexts. For example, summer temperatures on Varanger are around 10 C, which explain why the treeline is located on the southern part of the peninsula, whereas summer temperatures on Svalbard are a few degrees colder. 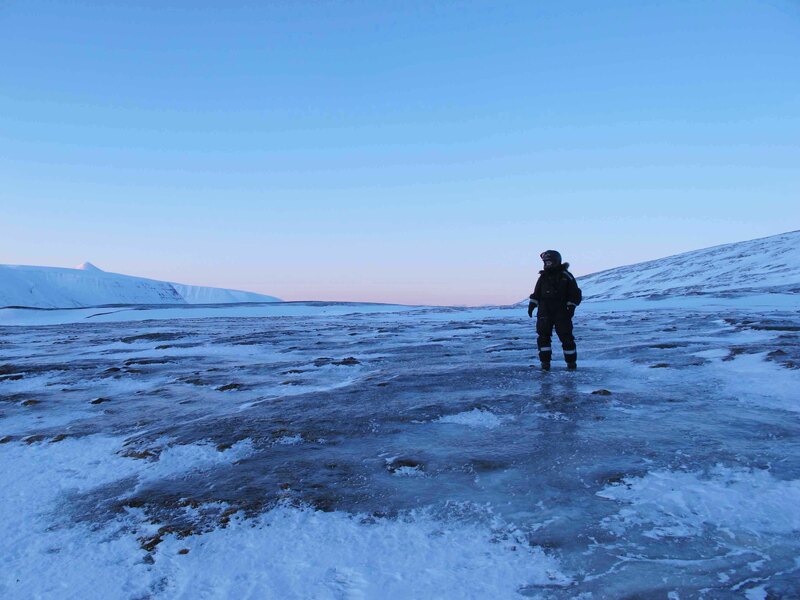 Rain on snow (ROS) events on Svalbard can form thick layers of ice (up to 10 cm) on the ground persisting for the whole winter, whereas ice layers are also present on Varanger but are thinner and located at different depths. However, we lack detailed information on weather and snow variability in Varanger and Svalbard. The very few weather stations that exist are located along the coast line and stations in inland areas are absent. This makes it difficult to describe and understand the complex physical processes linking snow cover and structure to weather parameters. Figure 1. Annual mean temperature at Svalbard airport (report) with year 2016 marked in red. 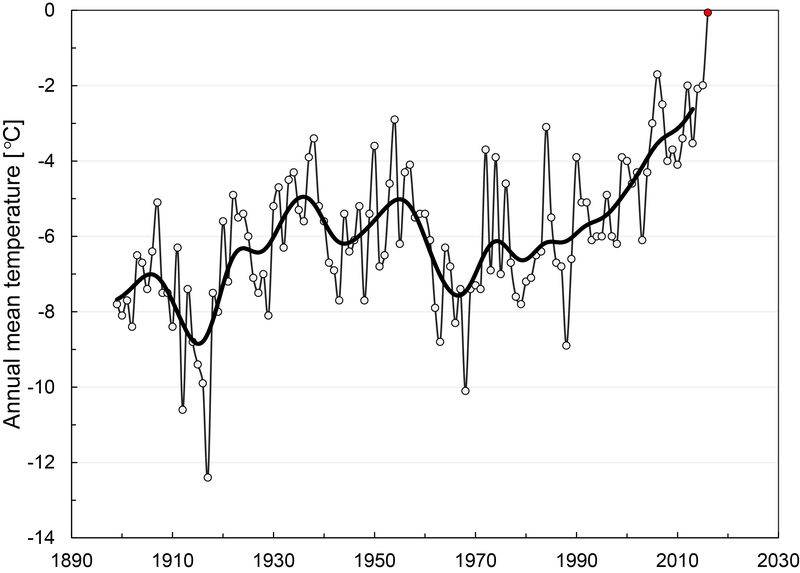 The thick bold line are filtered data and show long-term variability at a decadal scale. There is a large uncertainty regarding climate projections for the coming decades. We therefore need detailed information on spatial and temporal variability of weather and snow to assess quantitatively how climate change affect and will affect tundra ecosystems. Weather is directly relevant for managed herbivore species such as reindeer, moose, willow/rock ptarmigan and geese. Snow and ice conditions influence strongly how much and where reindeer and moose access vegetation during winter, influencing their winter survival and body condition in spring. Weather conditions during egg laying and brood rearing are important factors for the reproductive success of ptarmigans. Earlier availability of nesting sites can increase goose reproductive success. Temperature and precipitation in the summer influence vegetation productivity and timing of plant growth. Climate thus affects herbivorous animals indirectly by modifying food availability. Snow/ice conditions play an important indirect role for a managed predator: the arctic fox. Snow and ice conditions during winter are likely to be critical drivers of fox resource availability; lemmings and vole on Varanger and reindeer carcasses on Svalbard. Resource availability is, in turn, an important determinant of arctic fox reproduction. In COAT, all climate effects on food webs are addressed in the respective food web modules. 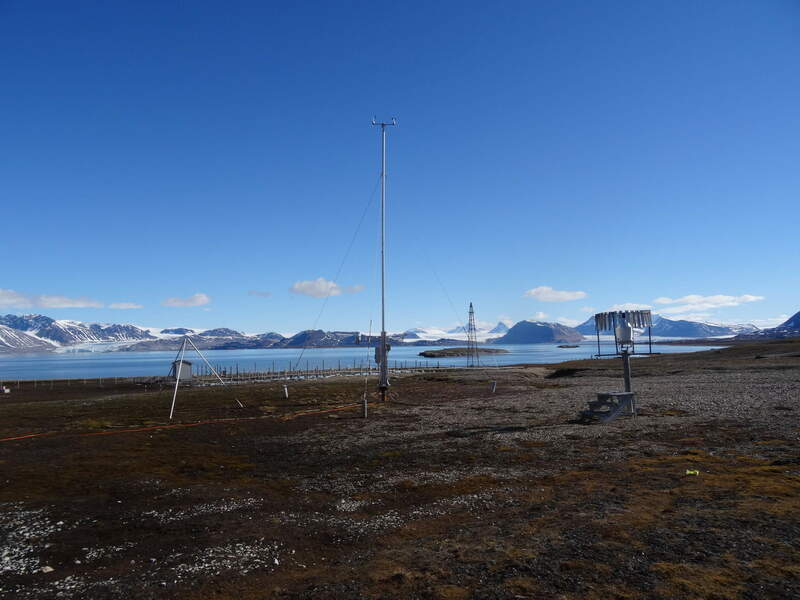 Weather will be monitored using new weather stations situated inland that will complement existing stations on the coast and these will be part of the network operated by the Norwegian meteorological Institute. 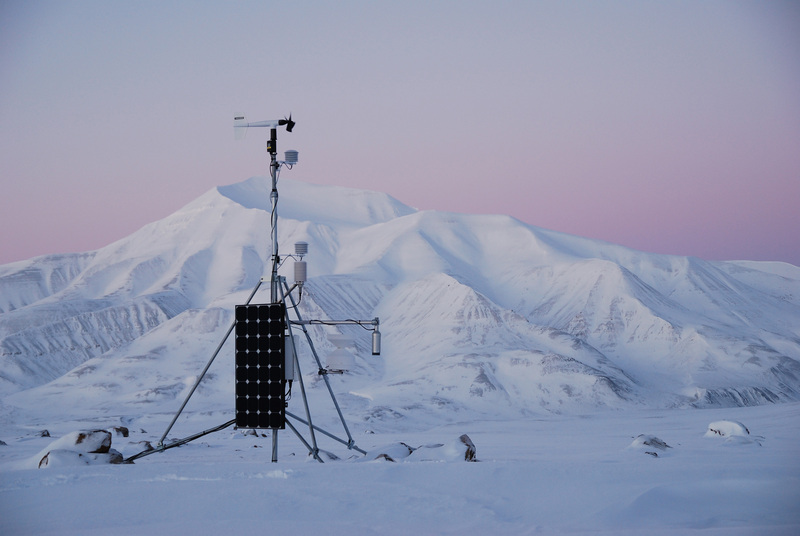 These stations will measure air and soil temperature, wind direction and speed, snow depth, air humidity and radiation on an hourly basis, and will be accessible in real time. 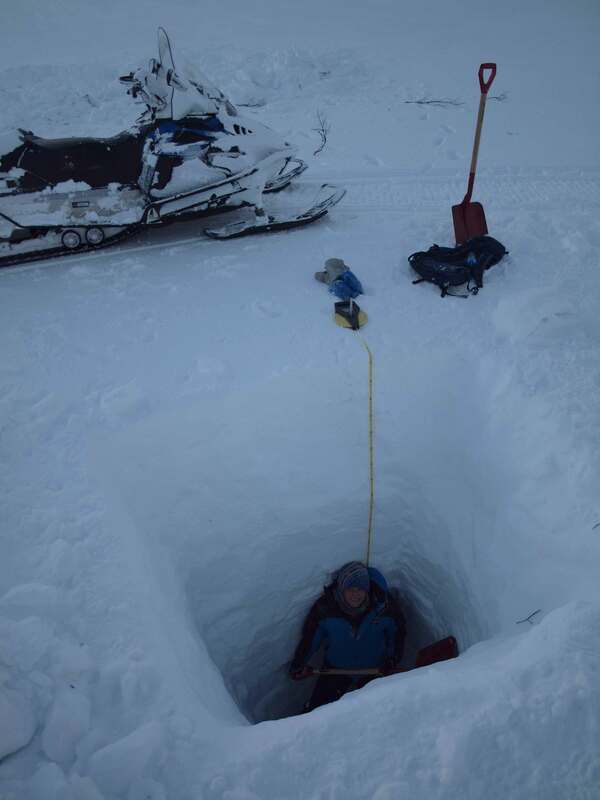 Snow conditions will be assessed by digging snow pits in March/April, focusing on structure of the snow cover and in particular, the presence and thickness of ice layers on the ground and in the snow column. Snow cover will be estimated at a larger spatial scale by using remote sensing, such as the MODIS snow products. 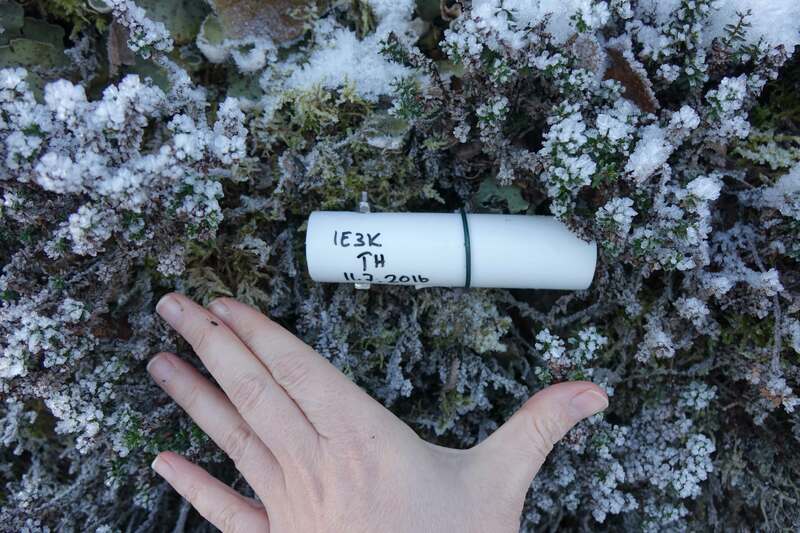 Time of snowmelt will be measured by using temperature data loggers on the ground. These measurements will be important for calibrating landscape snow models fitted using the data provided by the weather stations. Berteaux, D., Gauthier, G., Domine, F., Ims, R.A., Lamoureux, S., Levesque, E. & Yoccoz, N.
Effects of changing permafrost and snow conditions on tundra wildlife: critical places and times. Legagneux, P., Gauthier, G., Lecomte, N., Schmidt, N.M., Reid, D., Cadieux, M.C., Berteaux, D., Bety, J., Krebs, C.J., Ims, R.A., Yoccoz, N.G., Morrison, R.I.G., Leroux, S.J., Loreau, M. & Gravel, D.
Arctic ecosystem structure and functioning shaped by climate and herbivore body size. 2014. Nature Clim. Change, 4, 379-383. Stien, A., Ims, R.A., Albon, S.D., Fuglei, E., Irvine, R.J., Ropstad, E., Halvorsen, O., Langvatn, R., Loe, L.E., Veiberg, V. & Yoccoz, N.G. 2012. Biology Letters, 8, 1002-1005.